'How To' Travel Videos from The Roman Guy. 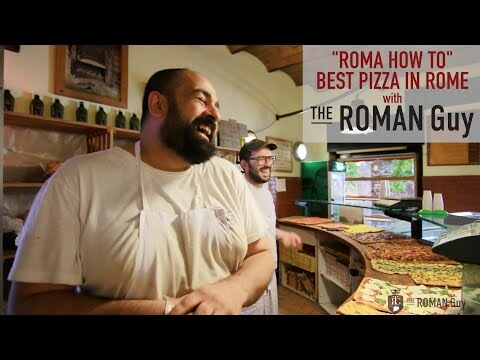 Ordering Roman Style Pizza made simple with just a few steps. Also some pointers on getting discounts! This is Bojan from The Roman Guy. We're here in our favorite district of Rome, Trastevere. Trastevere is known for many awesome places. One of them is the Basilica of Santa Maria in Trastevere. Today, we're going to explore something different, La Renella, our favorite bakery. La Renella is famous for making bread, and the Roman style pizza. What makes Roman-style pizza so different? Well, here we call it "pizza al taglio". This literally means that your pizza will be cut in slice, weighed on a scale, and given to you. You can pick whatever you want and also the size of the pizza. We're outside of the legendary bakery, La Renella, they've been making bread since the time Napoleon ruled here in Rome. I'm pretty hungry, let's head inside. I want to sing you a song about pizza. Posso ordinare un pezzo della margherita? One trick to getting a discount, is to carry large bills with you. If they don't have enough change, they might round it down and you'll end up with a euro discount. Getting a discount depends on the delivery, but also on the mood of the person behind the counter. If the cashier woke up on the wrong side of the bed, you're not getting that discount. No mi dispiace. Diciamo dieci? Dieci? Va bene dieci dai. I'm really happy with the results. The Roman Guy wishes you a good luck. That's how you get your discount on pizza. See you soon in Rome.